If you were born after 1973, CONGRATULATIONS! You made it out of the abortion holocaust ALIVE: 1 in 3 pregnancies end in abortion in the United States. January 22nd marks the 41st anniversary of the Roe v. Wade decision. Since 1973, MILLIONS dead; approximately 60+ million. Since 1973, MILLIONS living with the ‘choice’; stats show 1 in 3 women are post-abortive, assuming one abortion per woman in the United States. More than half of all post-abortive women have had more than one abortion. I love prolife week, and I HATE IT. Prolifers, advocates, activists and apologists need to have time to reflect, discern and prepare to do more for the unborn and the moms that murder them. I hate it because this just shouldn’t be; women were never to be baby killers but LIFE BEARERS. The legacy of Death Roe was started by Texas attorneys seeking a name for themselves and found the perfect abortion customer: poor, unmarried, desperate. Sarah Weddington and Linda Coffee will be forever known as the ‘women’ that killed and continues to kill over 1.5 MILLION unborn children every year. These two opportunistic attorneys have made a baby murder legacy that squelches what Molech, King Herod and Adolph Hitler did. Abortion death legacy has left millions in utter despair – most post-abortive women regret their abortion(s). Hypocritical Right to PRIVACY? The question is: Whose ‘right’ is it anyway? Burying Death Roe in the 14th Amendment was liberal slight-of-hand and decided the fate of unborn millions by taking their right to privacy and handing it over to the abortionist. “I’ve got a pen and I’ve got a phone.” Much like Obama whined, “I’ve got a pen and I’ve got a phone,” we are just as empowered to do what it takes to unravel BAD LAW and a pathetic presidency that has ruined this country. Lord, you are God of all. You created us and loved us. But we have sinned against you, Lord – and for that I ask You for forgiveness. Lord God, we have failed as a nation and as a people. We have given Molech our children instead of dedicating them to You for Your work – we have sacrificed for ourselves. We have sinned. We have sanctified the world instead of You. For that I grieve. We have been disobedient and insolent. Precious Lord, bring us to a saving place that only You can provide. Lord, we know that Your provision means every blessing, including our children. I also know that through Your holy provision you gave us Jesus, the only sacrifice for sin and that You would never ask us to sacrifice our children. I pray that You will bless our efforts to abolish abortion. I pray that You will encourage us daily through word and deed that we are in Your divine will. I pray, Lord, that we are a faithful witness to a dying world. I pray for the full armor of God to protect us from harm and to gird us with Truth. Lord, keep Your Holy Word close to our hearts and minds that we would have an answer for every question. It is our intention to always seek You first and always. And finally, Lord, I pray with great supplication that you will shut down this abortion facility in our city so that it would be a great example of what You will do when people pray. Let not the aborted children die in vain. In Jesus precious name I pray, AMEN. Let it be DONE. Galatians 1:15-16, CALLED FROM THE WOMB. Previous postMKL Day – Unborn Black Americans and ‘The Dream’ They Will Never Know. Sad U.S. still has not woken up. 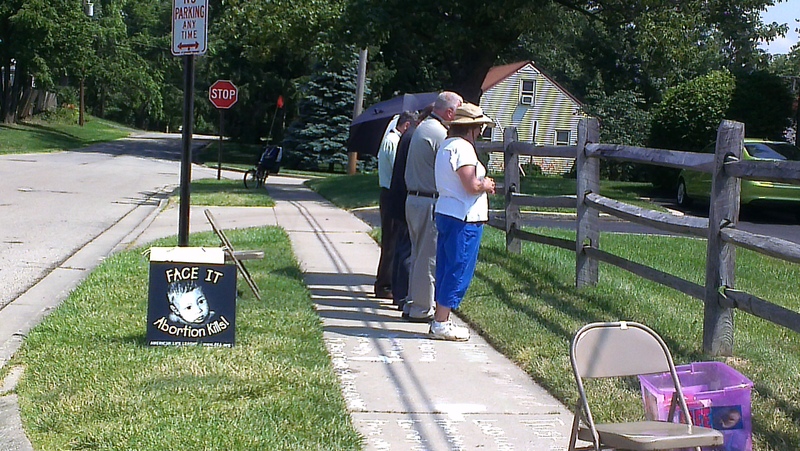 Praying to END ABORTION.